Nginx, the fastest growing web server, has reached 33.3% market share. Seven years ago, it only had 3.9%. On average, every minute one of the top 10 million websites starts to use Nginx. Just to put that growth rate in perspective: this is 70 times the number of sites that switch to Node.js, another fast-growing web server. In the same time frame since 2010, Apache's market share fell from 71.5% to just below 50%, and Microsoft-IIS fell from 20.6% to 11.3%. As expected, Nginx gains most sites from Apache, but quite a fair number of websites also make the switch away from Nginx. Webmasters are flexible these days. 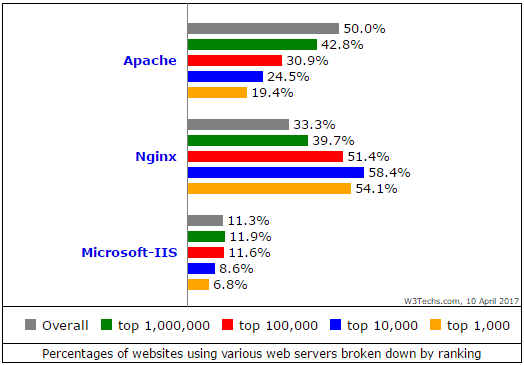 Nginx is the most popular web server among high traffic sites, with a market share of 58.4% among the top 10,000 sites. 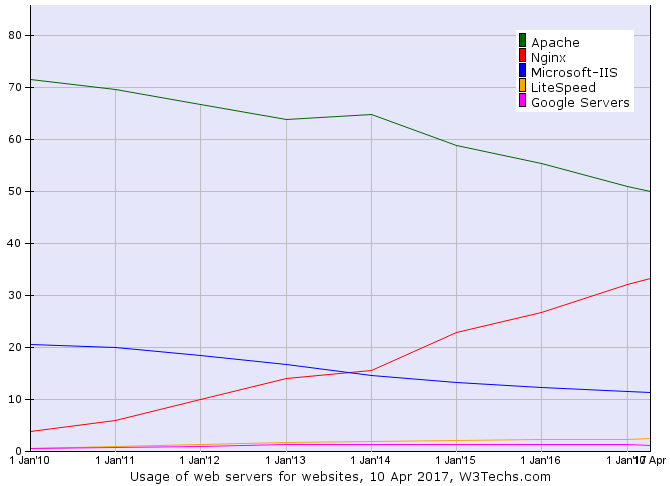 Apache is still leading among the top million, but the gap is already very small: 39.7% for Nginx vs. 42.8% for Apache. Nginx has 76.8% market share in Russia, where is has originally been developed by Igor Sysoev in 2004. A similar market share is achieved in some countries of the former Soviet Union, such as Belarus, Ukraine and Kazakhstan. 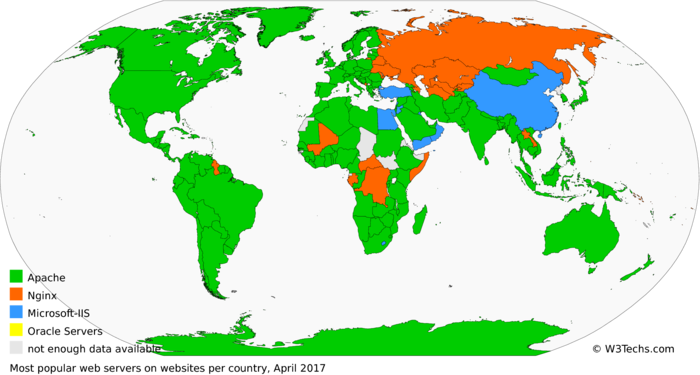 Nginx is also market leader in some countries in Asia, Africa and South America. Apache is still the market leader in most countries particularly in the Americas and most of Europe, while Microsoft-IIS leads in China, Turkey, Egypt and in some Arab countries. Nginx is the leading web servers supporting some the the more modern protocols, which is probably one of the reasons why people start using it. 76.8% of all sites supporting HTTP/2 use Nginx, while only 2.3% of those sites rely on Apache. This is not really surprising, considering that the HTTP/2 module of Apache is still classified as "experimental". Similarly, 63.3% of all sites that support IPv6 run on Nginx, almost three times as much as Apache. A good indicator for future market share trends is the distribution of technologies among new sites. Nginx is also doing better in that segment than on all sites, but just a little better: 36.4% for Nginx vs. 47.7% for Apache and 10.8% for Microsoft-IIS. Keeping an eye on our daily updated trend chart will show you future developments in real-time. The article mentions Node.js, but it doesn't seem to account for the fact that often nginx and node are deployed together. Has this situation been measured? We do see more than half of the Node.js sites run behind Nginx. In that case we count them both for the statistics. For that reason, if you add up all the web server percentages, it's somewhat more than 100%. We can often derive the use of technologies by detecting other technologies that rely in them. For example, if we see Express or Ghost being used, we know that site also uses Node.js, even if the server HTTP header shows Nginx.